Boat fuels are being studied and altered just like other petroleum products. The objective is to provide cleaner burning fuels that produce better mileage with fewer contaminates released into the water and air. The new fuels are often mixed with Ethanol, a common practice with automotive fuels for gasoline combustion engines. Although Ethanol is a great gasoline additive for automotive engines, caution needs to be exercised when using it for watercraft. Fuel hoses and fiberglass fuel tanks have suffered breakdowns with the use of Ethanol, a major concern to the marine industry. Studies have determined fiberglass fuel tanks are not compatible with Ethanol fuels, but plastic (polyethylene) tanks do not appear to suffer any ill effects from use of the new blended fuels. Both gas and diesel with Ethanol are subject to problems, however. Many of today’s boats come from foreign markets, which is also a cause for concern. Owners of diesel powered craft need to monitor their fuel systems carefully. In a recent article published by BoatU.S, it was reported by a fiberglass expert; “A diesel/soy blend fuel would not likely be detrimental to a fiberglass tank.” As a vessel owner, I do not want to operate a diesel engine using a diesel soy blend if experts feel it would “likely” not damage my fiberglass tank. I would want to be certain before filling my tank. We are quickly learning changes in the make up of fuels give cause for extra caution. As we move on in our experiments with fuels and additives, problems will occur. With the various materials used to manufacture today’s marine fuel tanks, it will be necessary to test new fuels and additives for their effect on those materials. It is my hope the petroleum industry does not ignore the marine industry as they conduct trials. The majority of today’s watercraft are produced with fiberglass, a petroleum product. Fires aboard fiberglass boats are rarely extinguished before they sink. 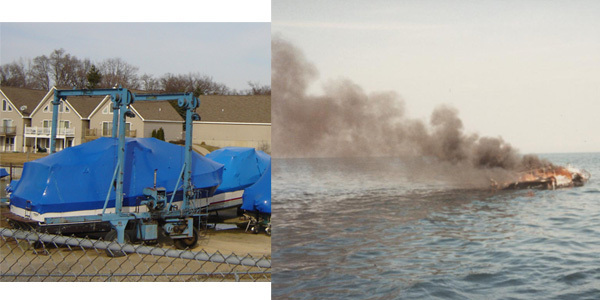 If you have ever seen a fiberglass boat burn, you know they burn hot and fast and water will not put the fire out. It is essential owners become aware of the components of their vessel and materials used to manufacture them. There are a few fuel filters being produced that use plastic fuel bowls which is not against Coast Guard regulations. The Coast Guard does not check for a reaction to fuel they only conduct a pressure test for two and a half minutes. In the past we were taught to run the blower prior to starting an engine. On vessels with electronic snifters installed, the best snifter is still in the middle of the operators face. Nothing replaces a good nose. This column was intended to alert boaters about possible dangers of boat fuels. It is also intended for those who purchase automotive fuel in portable tanks and transfer it to their boats. Although this has always been a dangerous practice, the danger may be increased with the use of the new fuels.